…and I also want to live the way my dad did. I recently blogged about wanting to die the way my dad did. It’s also equally true that I want to live the way he lived. God’s fingerprints are all over that story too. As an infant I was adopted by Jim and Corey Forstrom. There were a million homes where I might have been placed, but God sovereignly delivered me to these extraordinary parents. I will forever be grateful for that. “Trust in the Lord with all your heart…” At age 9, the Lord prompted Dad to place his trust in Jesus for the forgiveness of his sins. He recognized that he was a sinner, deserving of the wrath of a holy God and that it was only by God’s mercy and grace provided through the death of Jesus on his behalf that he could be made right with God. Dad understood that God’s free gift of salvation could only be received through faith and not through doing good works. Yet his life was characterized by good works, not as a way to earn his salvation, but out of gratitude for what God had done for him. At age 19 — in an Iowa bean field of all places — the Lord impressed upon my dad a conviction to enter into full-time Christian service. And oh how he followed that call! By the time I entered the picture ten years later, my dad had finished college and seminary, and had been redirected from being a missionary in Africa to serving as a youth pastor in two different churches in Chicago and Minneapolis. We then went to Crystal Free for four years before spending the next 22 years here in this church [First Free Rockford, Illinois]. And then my parents moved back to Minnesota for 8 years of involvement with the National Free Church missions, followed by 12 years of volunteer service before returning here to Rockford for these past five years. What I’d really like to share with you today is what I’ve personally gained from being Jim Forstrom’s son. What a privilege to have had him as my dad! As I reflect on what his life meant to me, I realize that I could speak for hours and hours about this. But for your sakes, I will choose just a few of his qualities to focus on today. The first thing that comes to mind about dad is his authenticity. What he taught, he lived. At home he was exactly what you saw anywhere else. He had a daily walk with Christ and he continually aligned his life with Scripture. This is his Bible and this was the foundation of his life. In a world where we see so many badly behaved so-called Christians who preach one thing but who live compromised personal lives, my dad stood out to me as the “real deal.” I got a front row seat in seeing what a real Christ-follower looks like and it made me want to be one too. If this is what being a Christian is all about, I want in! Anyone who truly knew him would have felt the same. His leadership in the home is the second thing that comes to mind. 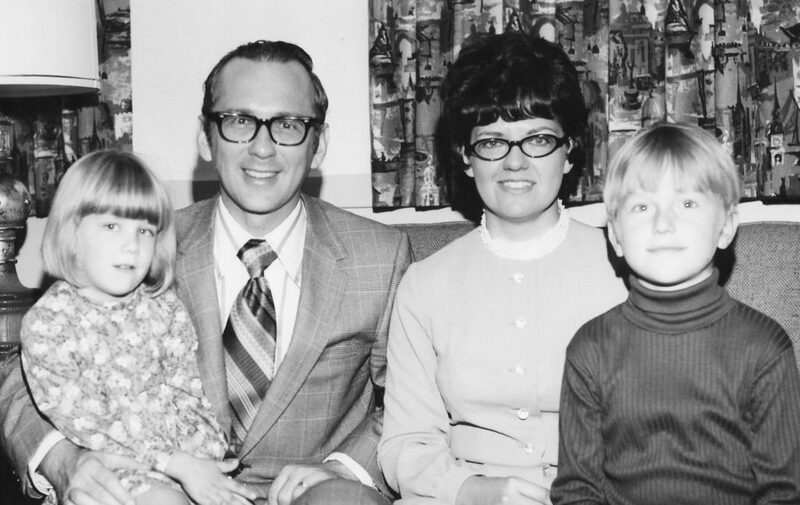 Because my dad led our home using the principles of Scripture, it was a place of good relationships, love, nurture, respect, support, encouragement, and great delight. I have only positive memories of those years. Shannon and I had the privilege of growing up in an unusually healthy home. Today, I find myself passionate about helping dysfunctional families become healthy, and I’m sure it stems back to the nurturing environment of my childhood home. I personally reaped the benefits of a healthy home and I want that for others. My future career in counseling finds its roots in my healthy home growing up. My dad’s humility in serving others is something else that I greatly admire. He was always content to be behind the scenes: planning, organizing, problem-solving, equipping, training, and deploying. He accomplished great things in life, but he didn’t need credit for them, or to be placed in the limelight, or to receive recognition. His life was more about others than himself. He preferred to make others shine. I need to be more like him in this way. His commitment to faithful hard work and finishing well have truly inspired me. I tend to be lazy, but no one could ever accuse Jim Forstrom of laziness. He was always on mission and enjoyed doing things that mattered. A couple of years ago, when dementia had begun restricting his ministry opportunities, I remember him asking me for prayer that he could still find some kind of useful ministry to do during his remaining years. It turned out that his final ministry was one of prayer, which he faithfully did right until the end. I loved browsing through his folder of prayer letter updates, with notations from him about many of them in the margins. They were his boys — and girls. How he loved praying for their families and the advancement of their ministries. On behalf of our family, I want to personally say how much your love and support has meant to us during this time of Dad’s homegoing . Yes, we are grieving that he’s not currently with us. But it is times like this that reveal the authenticity of our belief in what Scripture teaches. We live based on the truth of this book and we die in the confidence of what this book teaches — that there is guaranteed for us an everlasting life with Jesus. Dad had no fear of death, in fact in his last conversation with Mom he talked about looking forward to being with Jesus. Eternal life is a promise for those like Dad who have repented of sin and self-effort and who have trusted in Jesus’ death and resurrection for salvation. Because of this confidence we don’t need to grieve like the world does. We grieve with hope. We know we will be reunited with Dad for eternity, enjoying the rewards that await all followers of Jesus who serve him well. I know that Dad wanted nothing more than for all of his family and friends to one day end up with him in heaven. Many of you listening to me [reading this] today never had the privilege to meet my dad. Perhaps he sounds like someone you wish you could have known. The good news is that you can meet him! Give your life to Jesus and you can spend eternity getting acquainted with my amazing Dad! I want to live the way my dad did because his life looks a lot like Jesus’. Thank you for being here for our family today. 25 years ago I almost didn’t become the Youth Pastor at New Covenant.